With almost 10,000 stores across the country, CVS says it is already where consumers are. The company is transforming some of its stores and their retail clinics into hubs for a wider range of care. "We're trying to transform the industry," says Dr. Alan Lotvin, executive vice president for transformation for the company. The health care industry, he says, is now organized for the convenience of doctors, hospitals and other providers of care. "I think there's an opportunity to organize around the consumer," Lotvin says. With almost 10,000 retail stores across the country, CVS says it is already where consumers are. Now, with the addition of Aetna, CVS also provides health coverage for 22 million people. 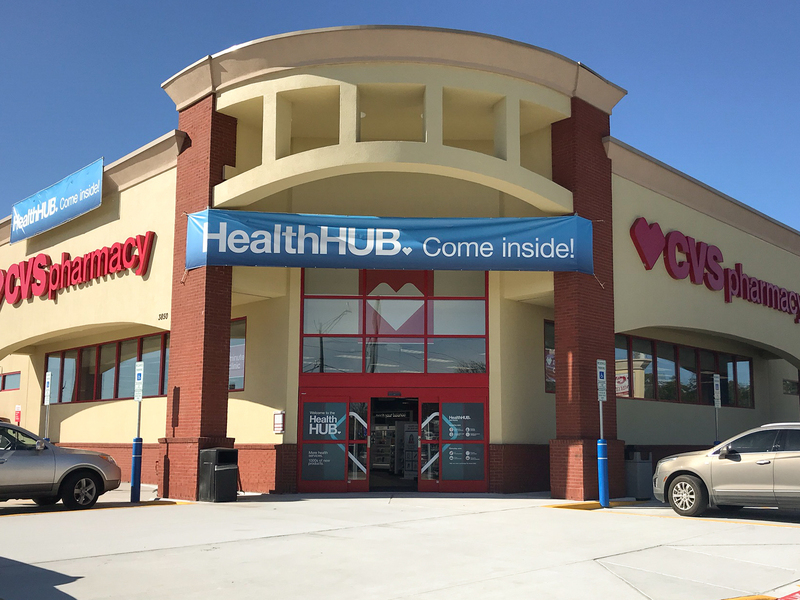 CVS plans to transform some of its stores and their existing retail clinics into hubs that will offer more health care services and products. The company put its first test locations in areas with lots of Aetna patients, in hopes of directing patients away from expensive emergency rooms to the stores' less pricey MinuteClinics. The company says this retail approach will make it easier and cheaper for people — particularly those with chronic illnesses like diabetes, heart disease or asthma — to manage their conditions. But the company faces challenges in making the combination of an insurance company and drugstore chain work. In a statement about quarterly financial results released Wednesday, CVS CEO Larry Merlo said, "2019 will be a year of transition as we integrate Aetna and focus on key pillars of our growth strategy." Some of CVS's lines of business have suffered lately, including its business supplying medicines to long-term-care facilities. CVS shares fell 8 percent Wednesday after the company posted a $2.2 billion loss for the fourth quarter and lowered its profit outlook for 2019. The pressure is on CVS to get the Aetna addition to pay off quickly. CVS Health began talking about the idea of health care hubs in late 2017 when it launched its bid to buy Aetna. At the time, Merlo asked NPR's Steve Inskeep to "imagine a world where [a] patient can walk into a CVS pharmac[y], they can engage with a nutritionist about their diet. They can talk to a nurse practitioner, perhaps have their blood glucose level checked, talk to their pharmacist about medication." But there were few details about how the company would pull it off, until now. CVS has opened three test locations in Texas, including one in the Houston suburb of Spring. At first glance, it's not all that different from any other CVS. There are aisles packed with candy and Band-Aids, fridges full of soda and in the back a bustling pharmacy counter. But over to the side there are sliding doors with the word "WELLNESS" in giant letters, and behind them a dozen seniors are taking a free yoga class. Rosita Rodriguez, 68, is one of them. "I did yoga," she says. "And it was such a joy." She says she found out about the yoga class when she came into the store to find some painkillers for her arthritis that wouldn't nauseate her. The store's "care concierge," Jesse Gonzalez, helped her choose a medication and told her about the yoga class and about how she could get her diabetes checked as well. "Whenever I need something, I see Jesse here," she says. "I talk to him and, you know, he's there for me." Rodriguez says the store is easier to get to than her doctor's office, which is about 20 miles away in central Houston. The MinuteClinic here is a major department. In addition to the care concierge, there are three exam rooms, a dietitian, a respiratory therapist and a lab where people can have blood drawn. On a recent afternoon, a patient who came to see the nurse practitioner was rushed to a nearby hospital. "They weren't feeling well and they were actually about to have a significant heart event," says Kevin Hourican, president of CVS Pharmacy, who oversees the company's entire retail operation. "So they were sent to the emergency room." That incident, he says, shows why it's good to have retail clinics all over the country. About 1,000 CVS locations currently have a small version of the MinuteClinic, he says, and 85 percent of Americans live within about 4 miles of a CVS store. The need for ER care for this patient also shows the limits of what a retail clinic can do. To help people manage their chronic diseases, CVS will expand its services to include eye and foot exams for patients with diabetes and airflow monitoring for people with asthma. "I see a number of upsides for patients," says Dora Hughes, a physician and associate professor of health policy at George Washington University. "Managing a chronic disease, I mean, that is hard work," Hughes says. "To have CVS and their broad community footprint available, to have providers that you can see at nights and on the weekends, to be able to get your bloodwork done when you want — I mean, that could be hugely beneficial for patients." But Hughes says the company will do the most good only if it locates "health hubs" where there is the greatest need — where people with chronic diseases like diabetes don't have easy access to doctors. The company chose the locations for its first three test stores where there are a large number of patients covered by Aetna, including its commercial, Medicare and Medicaid businesses, and a lot of people with diabetes. Another question, Hughes says, is whether CVS can communicate well with patients' primary care doctors. Some research shows that people with a regular primary care doctor have better health in general, and some shows that people with diabetes get higher quality care from a regular primary care physician than when receiving episodic care from other doctors or nurse practitioners. "I can see concerns that people might have that this might make that connection with the primary care home lower, says Kosali Simon, a health economist at Indiana University in Bloomington. "I now might say, 'Maybe I don't need to have a primary care physician that's connected to a hospital.' "
In fact, a survey by J.D. Power showed that 45 percent of people said they would consider getting their primary medical care at a CVS clinic. Older people were more hesitant to try a MinuteClinic, the survey shows. Only 36 percent of people 65 and over said they would go to CVS for primary care. But Simon says, and the survey confirms, that the added convenience is likely to draw people in. After buying Aetna, CVS expects these new clinics will help keep some Aetna patients out of the hospital and allow the insurance side of the company to avoid the high costs of hospital care. At the same time, the expanded stores will make money treating patients at the MinuteClinic and selling an array of health care products. The store in Spring, in addition to the usual CVS products, has an aisle stocked with wheelchairs, walkers and CPAP machines that help people with sleep apnea. There are yoga equipment, snacks appropriate for people with diabetes and electronic activity monitors. CVS says the health care services will be available to patients with any kind of insurance. The company won't say how many stores it plans to convert to health hubs. CVS's Hourican says the company first wants to see how it goes in three Texas trial locations.